BRIGHTON, Mich.- Ford Motor Company is seeing impressive success with its electrified vehicle line up. 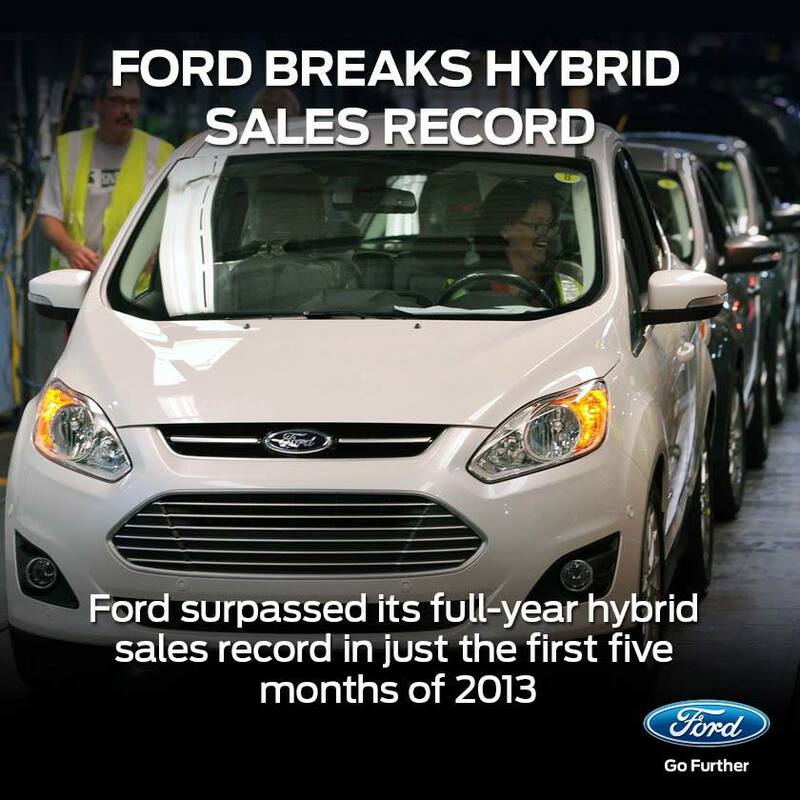 So much success, that Ford broke its previous full-year hybrid sales record in just 5 months this year! Ford's U.S. sales analyst noted that this hybrid success has energized the whole company! Meeting an unprecedented customer demand, the automaker has experienced an increase of over 375% over the same time last year! Ford Motor Company broke its hybrid vehicle sales record of 35,496 vehicles in 2010 with projected sales of 37,000 through May! Ford's market share has grown to an all-time-high 15.5%, due mostly to the product strength of the new electrified vehicle line up. This makes Ford second only to Toyota when it comes to the number of hybrid vehicles sold in the U.S.! New customers have continued to come to Ford from competing brands like Toyota and Honda, thanks to the automaker's line up including the Ford C-MAX Hybrid, Ford C-MAX Energi, Ford Fusion Hybrid, and Ford Fusion Energi. Ford's eco-friendly vehicles have been so popular that they are flying off dealer lots! Dealers have seen one of the fastest turn rates with the Ford Fusion Hybrid, just 14 days on average. Key markets like Los Angeles, have experienced an even shorter turn rate of 10 days as customers are attracted to the vehicle's impressive fuel economy and new stylish design. Today's drivers are demanding better fuel economy, but don't want to sacrifice appearance in the process. And Ford, ranked No. 1 in fuel economy customer satisfaction by J.D. Power, is providing just that. Enjoy the best of both worlds, fuel efficiency and appealing design, with a new Ford vehicle. We have a huge inventory of Ford Cars For Sale at your South Lyon Area Ford Dealer! Stop by for a test drive today! Brighton Ford is located at 8240 Grand River Ave. just north of I-96 in Brighton. We are a family owned and operated business that strives for customer satisfaction. For more information on Brighton Ford visit BrightonFord.com or give us a call at (800) 836-8206.